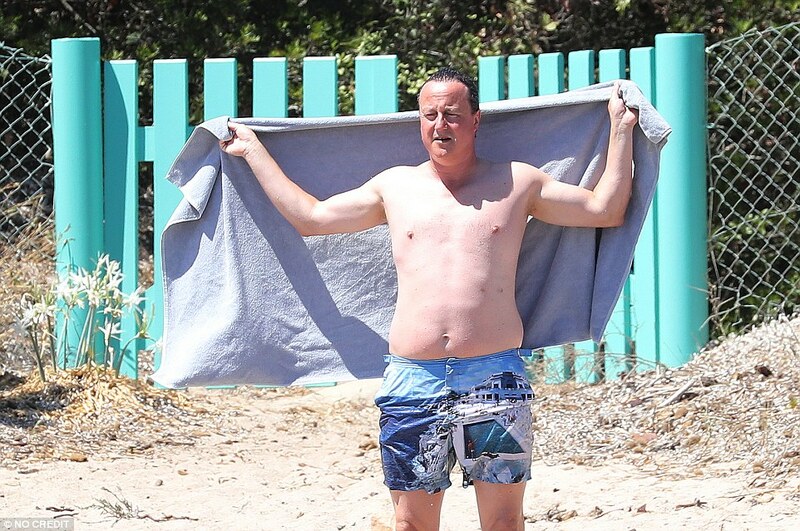 David Cameron is enjoying his second holiday since quitting as Prime Minister last month. 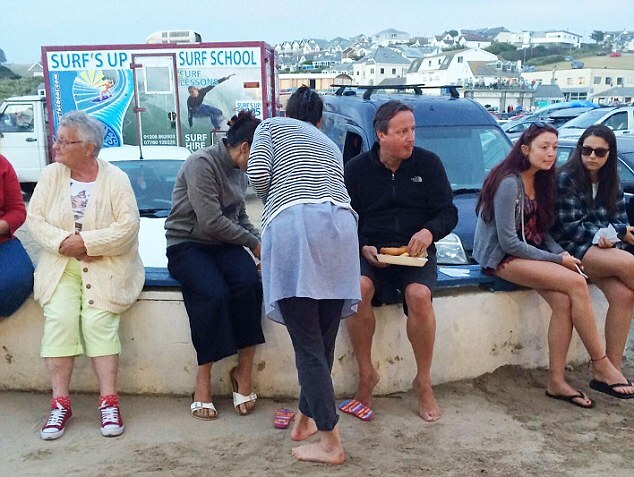 He was spotted chomping on fish and chips with his wife Samantha last night on Polzeath Beach in Cornwall – a favourite holiday spot for the former premier. At the same time his successor Theresa May was returning from her Swiss hiking holiday to kick-start her Brexit plans. Mr Cameron’s latest break follows his exotic holiday in Corsica earlier this month, staying in a luxurious villa on the French island with his wife and three children just days after bidding an emotional farewell as PM from the steps of Downing Street. He was dubbed the ‘chillaxing’ prime minister during his time in office due to his ability to separate his private life form his professional life and his second holiday in as many weeks suggests he is keen to rack up his relaxation time now he is no longer burdened by his job in No 10. 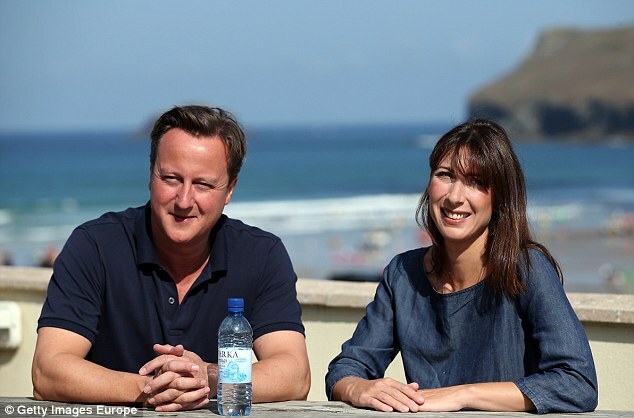 Polzeath beach was a regular choice for Cameron family holidays, most recently pictured there on a break last summer. Pictured last night, Mr Cameron wore navy shorts with a North Face fleece with no sign of the £225 designer swim shorts he showed off during his holiday in Corsica earlier this month. 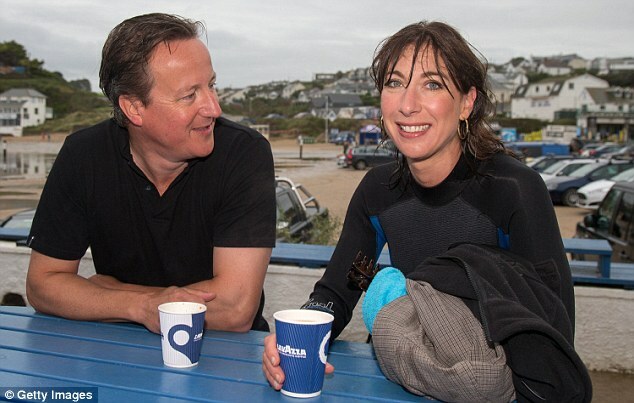 While Mr Cameron and his wife were regularly snapped dressed in summer and beach wear during their holidays in beach-side cafes, the official photographs of Mrs May’s first holiday since taking over as PM suggests she enjoys rather different types of breaks to her predecessor. 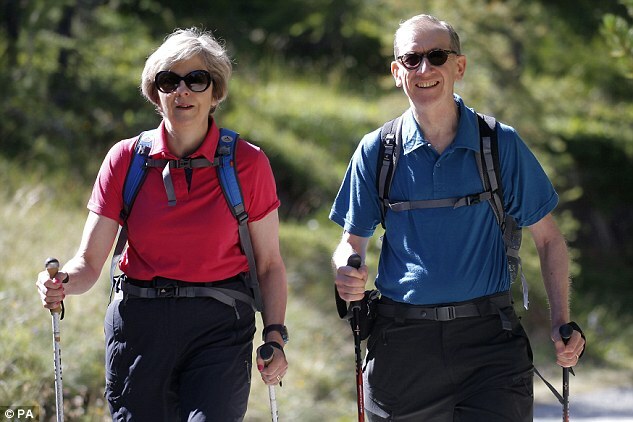 The Mays looked ready for action as they headed out into a forest using hiking poles and wearing similar walking trousers, boots, polo shirts and rucksacks earlier this month. The Prime Minister said she and her husband ‘discovered the joys’ of walking in the country ‘quite by chance’. In a piece for the Telegraph in August 2007, she said: ‘We first visited the country about 25 years ago but spent most of the time in Lucerne. ‘On a return trip, we decided to go walking, enjoyed it and gradually began doing more adventurous hikes. 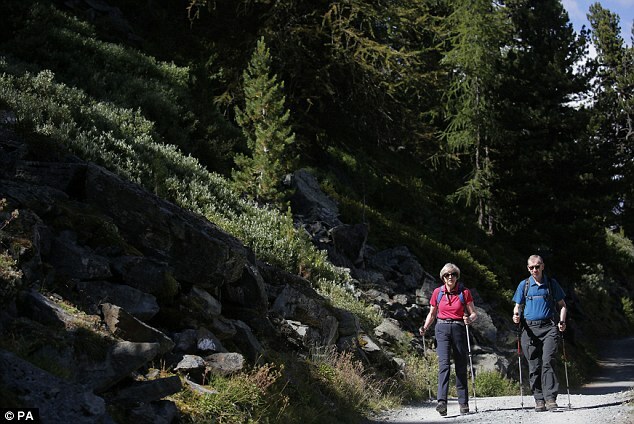 Mrs May said her two favourite areas are Zermatt and the Bernese Oberland, which are both ‘fantastic for walking’. During a recent visit to Berlin, her first overseas trip as premier, Mrs May gave German Chancellor Angela Merkel two books about hiking to reflect their shared passion for the hobby. But it was back to the office for Mrs May today as she headed back to Downing Street to prepare for months of Brexit negotiations.